There are many ways to install a domestic solar hot water system. This page describes perhaps the most commonly used type of installation for a closed loop solar hot water system in a typical UK home. Installing a solar hot water system calls for similar skills as required to fit a central heating system, with the added ingredient of having to gain access to the roof, just to spice things up! Keep in mind though the big difference which is that the solar circuit can reach much higher temperatures than regular domestic plumbing, possibly well in excess of 100°C. Because of this, it is important that all components should be able to withstand these high temperatures. Also, position the components in such a way as to minimise their exposure. Place pumps, controls etc on the return leg of the circuit, so that the solar fluid has been cooled by the water in the hot water cylinder. Even high temperature solar expansion vessels are only rated for 110°C, so place these on an uninsulated branch a little way from the solar circuit. The use of a pump station makes for a neat installation and fewer individual components to worry about. Make sure that the solar loop is well insulated with high temperature insulation. A poorly insulated solar circuit can cause a significantly greater loss of efficiency than a sub optimal collector orientation. For the sake of clarity, a heat dump circuit is not shown on the above diagram. 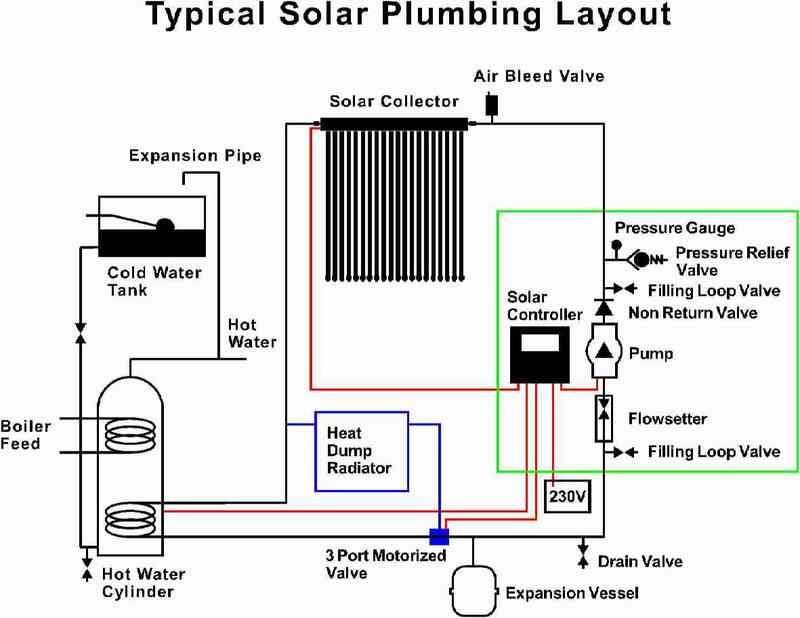 It would normally be T'd off from the solar circuit so that it bypassed the solar heat exchanger but still incorporated the other components, as shown in the following schematic. The heat dump circuit is shown in blue. Note that this diagram does not represent the physical positioning of the various components, the heat dump radiator is normally placed in an attic. The components provided in a typical pumping station such as a Flowcon A are shown outlined in green. The red lines represent electrical connections. The solar plumbing is essentially the same when using an unvented, pressurised hot water cylinder, where the cylinder is fed directly from the water main and the cold water tank is absent. In this case various components not shown on the schematic, including an additional expansion vessel, are required to ensure the safe operation of the cylinder. Note that the various plumbing components are on the return leg to the collector, which is cooler than the hot water cylinder feed (the solar fluid circulates in an anticlockwise direction here). The Evacuated tube collector includes a stainless steel frame which is designed to be mounted on a pitched roof. In order for the heat pipe to work, the collector must be between 15° and 90° to the horizontal. In order to collect the maximum amount of heat, (here in the Midlands, UK) it should be at an angle of around 30° to the horizontal. However, up to 15° either way makes little difference, which conveniently includes most standard roof pitches. All things being equal, a steeper inclination will enhance the winter heat collection, and a flatter one the summer. Bear in mind though that the great majority of insolation occurs in the summer, so optimising for the winter will reduce the net energy collected through the year. Similarly, the roof should ideally face due south, but anywhere between southeast and southwest will give satisfactory results. Choose a position on the roof which is not shaded, and consider that shading in a particular place may be more severe in winter when the sun is lower in the sky. See here for more on this. Be aware that safe access to the roof is required to install the collector, and that a body of legislation exists governing safe working at height which applies to commercial installers. While this legislation appears not to cover DIY installers, this does not make injury less likely!. A scaffold tower and a pair of roof ladders with a platform between would appear to be the minimum requirement. These can be hired at modest cost from national hire companies. The collector frame and header manifold is usually best assembled on the ground (without the tubes, see assembly instructions here) and then lifted onto the roof. The approved method is to use a hoist mounted on the scaffold tower. The panel is usually fixed to the roof in one of two ways. Generally the simplest way to fix the collector frame to the roof is to use stainless steel straps. These are fed between the tiles or slates and wrapped around and screwed to the roofing battens in the loft. Note that a slot must be cut in the sarking felt under the tiles or slates. Poke the strap between the tiles and have an assistant cut the felt in the right place. Be sure that the battens are sufficiently strong, and if in doubt, fit a trimmer between two rafters. Use one strap at each corner, and bolt the frame to the external end of each strap. The frame must be lifted a little from the roof to give access to the bolt for a socket. Take an offcut of 4 x 2 or similar to support the frame while doing this. For the Eco-58-1800-30, an additional two mounts are used at the centre. The advantage of this method is that no penetration of the roof is required for mounting the panel. Alternatively, for a slightly more positive fitting, use a threaded coach bolt. With this technique, lay the frame on the roof and drill holes in the tiles to match the holes in the vertical frame rails. Use a 9 or 10mm masonry drill and go gently without percussion action to avoid cracking. For very hard tiles try using a glass drill. It should be possible to drill two of the holes above a rafter by careful positioning (use a piece of flat strip as a probe). For the other two holes, cut 4" x 2" trimmers so that they are snug fit between the two rafters and nail them in place. Drill a 5mm pilot hole through the tiles in the timber to the full depth that the bolts will be sunk, and then screw in the bolts, leaving sufficient proud of the tiles to attach the frame. Use silicon sealant to make good the waterproofing around the bolt, and then fasten the rubber washer against the tile with a nut. Do not overtighten as this may crack the tile. When all bolts are in place, install the frame and secure with nuts. Do not install the collector tubes until the circuit plumbing is complete and the system filled with coolant. Placing the tubes in an unfilled manifold will quickly result in a very hot (and potentially dangerous) panel! Two large collectors may be plumbed together in series, but for an array of more than two (for commercial or other high volume use) it is recommended that they should be connected in groups of two in parallel to reduce pumping losses, and also reduce the risk of overheating in summer. Two Panels plumbed in series. Four panels plumbed two by two in parallel. Use 15mm copper connected to the panels via compression fittings. Plastic pipe should not be used as it will not stand up to the prolonged high temperatures which the panels can produce. Solder joints should be avoided as, in a stagnation situation where water for some reason is no longer being circulated through the panel the temperature of the manifold could exceed the melting point of the solder. Ordinary white PTFE joint sealing tape is fine for use in high temperature applications, for example at the pump station connections.. The pipe runs must be insulated with high temperature pipe insulation, for example Armaflex HT. Ordinary insulation for hot water pipes may well melt at some stage. Care should be taken where the pipes penetrate the roof. Depending on the roof surface (slates, tiles etc) it may be necessary to fit a special tile or lead slate which the pipes run under and into the roof space. Alternatively, carefully drill a hole in a tile with a diamond or abrasive hole saw and make good around the pipe with silicon sealant (which will cope with the high temperatures involved). Make sure that the tile is unobstructed by rafters etc on the inside at the position chosen to drill the hole. Typically, insulation is not passed through the hole, but butted up on each side. This is a trade off between good insulation practice and ease of sealing. An air vent should be fitted at the highest point in the circuit to allow it to be purged of air. Avoid local high points where air could be trapped in the pipe runs. Other than for small installations using unusually large hot water cylinders, if there is a possibility that the house may be vacant in summer, for instance during holidays, then a heat dump circuit should be employed. This is a bypass of the hot water cylinder heat exchanger which routes the solar fluid through a small radiator mounted in an attic or garage. When the hot water cylinder reaches its preset maximum temperature, a motorised valve diverts the flow through the radiator and dumps the heat. This prevents the solar fluid from boiling. The radiator must be placed where the heat from it will not be a nuisance (since it will be working in summer) or a hazard (since it may well run hotter than a conventional radiator). A BS3 or better controller is required to operate the valve. As always, the motorised valve must be suitable for high temperatures, and should be on the return (to the panel) leg of the circuit. Note that the effective heat storage capacity of a hot water cylinder can be increased by setting the maximum temperature higher than would usually be the case, and using a tempering valve to mix the hot water with cold before delivery to the hot taps, to prevent scalding. The solar hot water cylinder has two heat exchange coils within it. The upper coil is connected to a conventional boiler, to provide hot water at times when the solar provision is inadequate. The lower coil is connected to the solar circuit (the water in the lower half of the tank will be cooler than that in the upper half (warmer water rises to the top of the tank) which enhance the heat transfer from the solar circuit). A standard central heating pump is used to circulate the solar fluid, usually set to its lowest setting. The solar circuit must be filled with a mixture of water and antifreeze. Because of its proximity to the domestic hot water, a non toxic antifreeze must be used. The most commonly used is a premixed solution of propylene glycol, corrosion and other inhibitors, and deionised water. Two valves are fitted to the circuit to allow for a filling/draining loop, with a valve between the two. With a pumping station (see here) or a fill/drain block (see here) these three valves are provided in a neat package. In order to fill the circuit with the antifreeze mixture some sort of pressurized filling device is required. This can be made from a garden sprayer, by simply replacing the lance with a connection which fits the filling valve. Such a device with adaptors ready to go is available here. The sprayer is connected to the (upper) filling valve, the adjacent drain valve is opened and the valve between the two is closed, the antifreeze mixture is put in the sprayer reservoir, the sprayer is pressurized and the filling valve is opened. When the antifreeze mixture begins to come out of the drain valve, close the drain valve and increase the pressure to around 2.5 bar. Then open the intermediate valve. It may be necessary to do this in more than one step if the capacity of the solar loop is greater than that of the sprayer reservoir. When the pump is running, slacken the large screw in the centre of the face of the pump to bleed the pump, then retighten. Ensuring that there is sufficient antifreeze solution in the sprayer reservoir, repressurize to about 1.5-2.5 bar, then open the automatic air bleed valve at the top of the circuit. Typically this valve is left open for a few days until all the air has bled from the system. An air scoop (see here) fitted somewhere convenient in the circuit will reduce the effort required to remove air from the system. The pump is operated by a differential solar controller. A temperature sensor is placed in the sensor housing in the collector panel, and another sensor is placed in the lower level of the hot water cylinder. The controller switches on the pump if there is a sufficient temperature difference between the water in the collector panel and the water in the hot water cylinder. When using Resol controllers, use the sensor with the black wire in the collector. This is because the lead has a high temperature silicon insulation which can cope with the temperatures which can develop there. Note that these sensors are not thermocouples, which produce a voltage the magnitude of which depends on temperature, but thermistors, which vary their resistance depending on temperature. Because of this, their connecting wires may be easily extended to at least 50m, provided the resistance of the wire used is not significant. Use wire, preferably stranded, of at least 1mm2 cross section, and solder the joints. Obviously, ensure that the joint is protected from damp and that the cables are electrically insulated from each other and the environment. Do not run the wire in close proximity to power cables as this will cause incorrect temperature readings. In the event of lightning striking a collector, a voltage surge will travel down the sensor wire and be likely to damage the controller. The use of an anti-surge device such as the SP1 will normally prevent this. The SP1 is connected in series with the sensor wire. It is important that it is connected such that the connection marked with an incoming arrow is connected to the sensor and that with an outgoing arrow connected to the controller. Note that electrical work is more strictly regulated since Part P of the building regulations came into force. While it has always been a requirement to adhere to wiring regulations, now many domestic electrical modifications require approval from a building control officer. It would appear that adding a fused spur for a pump/controller, provided it is not in a kitchen, bathroom, or other special location, does not require notification to building control. Information is currently available here, although the government will probably decide to move it soon. If in any doubt consult your building control department.